Multi Speciality Hospital Software is a comprehensive ready to use software designed to manage and automate the operations of Multi Speciality Hospital which includes Patient Appointments, Registration of Inpatient/Outpatient, Investigation Management, Cashier management, Hospital Staff Management, Hospital Inventory Management, Pharmacy Management, Finance & Accounting, Dental management. 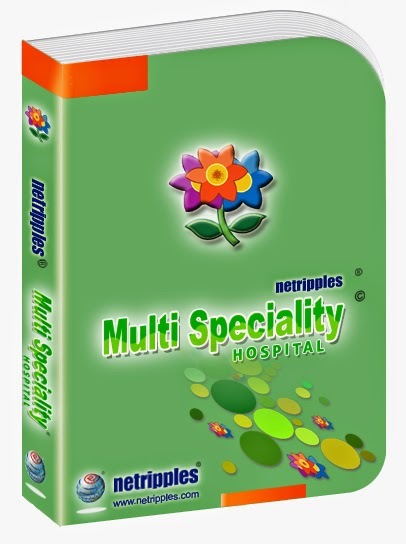 Netripples Multi Speciality Hospital Software is a comprehensive ready to use software designed to manage and automate the operations of Multi Speciality Hospital which includes Patient Appointments, Registration of Inpatient/Outpatient, Investigation Management, Cashier management, Hospital Staff Management, Hospital Inventory Management, Pharmacy Management, Finance & Accounting, Dental management, Pediatrics management and over 200 Individual/Summary reports. User Friendly Screens with built-in Help, Security & Administration of Software along with Auto Report Headers are other flexible features of the Software. Key Modules covered are listed here. Cashier Management : This module manages all patient payments and includes charge collection against the invoices/ Bills generated at various stages and recording the receipts, Payments including cash counter opening cash and closing cash details.